For a writing class I was challenged to tell the backstory of how my father got his dog Muggsy. 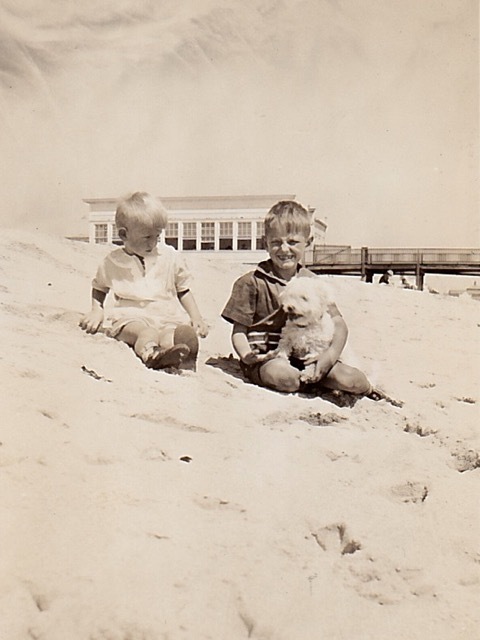 His father had brought the dog home one day in 1934 or 35 after finding it while waiting for the ferry. Muggsy fit in my grandfather’s pocket. This piece is fiction — and I don’t write much fiction, but it was fun to give it a try. She rocked on her heels under a tree while it rained. The little bit of shelter offered relief, plus someone had thrown a crust from a sandwich there. She broke the stale bread in half and offered one piece to her dog. “Dunno why Mama don’t want me sharin’ with you,” she said to the dog, as he licked her hand. Toward evening the blind man arrived to beg. He tap-tap-tapped his way to his usual spot. “Hep me out,” he called as people approached, and he extended his empty open cigar box in front of him. “Can’t see. Can’t work. Hep me out,” he called, and then waited. The little white dog lapped water from a dirty puddle while the girl watched men dig into their pockets and throw coins in the box. A lanky man in an overcoat stopped in front of the beggar. He rummaged in his pocket. “Here you go, friend,” he said, placing a few coins in the box. He patted the blind man’s shoulder and left his hand resting there a moment longer. “Thank-a,” said the blind man. She scooped up her dog, muddy paws and all, and ran after the man. “‘scuse me, sir,” she said, as loud as she could. He was heading straight for the Hoboken ferry. “‘scuse me, sir,” she repeated. He stopped and looked at the thin little girl whose outgrown dress was smeared with mud. “Can I help you?” he asked. “Do you live in Hoboken?” she asked. A smile played at the corners of the man’s mouth. “What happened here?” he interrupted, gently touching a long dark bruise on the inside of her upper arm. Four similar parallel bruises marked the outside of her arm. She pulled the dog back and tried to cover the marks with her sleeve. He noticed a matching set of bruises on her other arm. He scratched the little dog behinds the ears. “You got a house?” she asked. “My wife doesn’t like dogs,” he said. Gently, he took the little dog from the girl and snuggled it into his overcoat pocket. “His name’s Muggsy.” Her voice cracked as she spoke and her eyes overflowed. He started to speak, but she had disappeared into the crowd. You may not write much fiction but this is a really lovely story that tugs and touches the heart perfectly. I smell a novella–or perhaps a novel? I DO have a novel that’s been taking form for a number of years, and it’s really start to nag at me.